Singapore : Just as diverse as India in religion, race or colour of skin, You never heard of a riot since 1864 barring one that happened in Little India. Singapore : The second Asian Country listed among the “First World”, next to Japan, another war-ravaged Country. Lee Kwan Yew, The Chinese man who never adopted a Western name. The longest reigning Prime Minister of any Country. The one who raised a war-shattered seaside village to the greatest city-state in the World. Population? 5.3 million. Resources? Next to nil except man-made tourist attractions and sea and air ports. GDP? Fourth per capita in the world, next only to oil producing countries. (US is 10th, India is 124th.). Got no Taj Mahal, no claim to great ancestry.Tourism? 12 million. India 6.8 million. Religion? 17% say they have no religion. An elected prime minister who dared challenge religious beliefs, but tolerated all religions (but for his retracted Freudian slip, “Islam is a venomous religion“). Who openly proclaimed :“I neither deny nor believe in God”. The man who wanted Singapore to be part of Malaysia and cried when the joint venture broke up, but soon raised Singapore economy and quality of life far above that of Malaya whose religious bigotry caused the breakup. (Malaya retained the name of Malaysia coined for the relationship). Benign dictator loved by his Countrymen, criticized by few. The man who said, ““Between being loved and being feared, I have always believed Machiavelli was right. If nobody is afraid of me, I’m meaningless.” Yet, repeatedly re-elected and celebrated by his countrymen. You might say that the only scar on his legacy is corporal punishment he wrote into the statute book and justified its practice. No Singaporean I met said it was a bad thing. “Keeps crime at the barest minimum in our Country,” they proudly say. Your passing yesterday proved that nobody is above death. 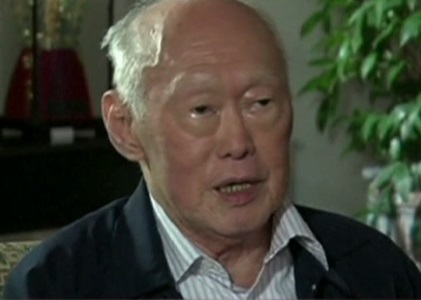 You had famously said “Even if I am in the grave, if Singapore needs me, I will get up“. Sadly, you didn’t believe in reincarnation. Signs are there is God, but it is doubtful He lives in the realm of death. In case he does live there, He would receive you well despite the resounding cries of those who got the whipping. Next ›INDIA MY COUNTRY – THE SIGNPOST FOR APARTHEID.